My friends and I enjoy grilling. Neither rain, nor wind, nor snow (yes – we’ve actually grilled while it’s snowing) has stopped us from enjoying freshly grilled ‘dogs and burgers. Of course when you grill that often, you need to get creative with your recipes – mix things up a little bit to keep your palette happy and interested. This recipe was inspired by one of my friends who LOVES breakfast. If given the choice, he would eat breakfast for each meal of the day, and he probably has at some point. With this burger, we’re giving a nod to our favorite breakfast foods. You can serve this recipe with baked beans, but another great option is the new Tangy Carolina BBQ chips from Lay’s. Lay’s has just introduced 7 new, regionally inspired flavors which includes: Honey Mustard, Chipotle Ranch, and Cajun Herb & Spice. I think the northwestern inspired Balsamic Sweet Onion sounds delicious. The new Lay’s Regional Flavored potato chips are made with all natural ingredients and 0 grams of transfats. I’ve only tasted Tangy Caroline BBQ so far and they are GOOD – definitely tangy, providing a nice twist on the traditional BBQ. Wrap bowl and place in refrigerator for 30 minutes. After the meat has marinated, remove from refrigerator and shape the meat into four large patties. Cook patties on grill or on the stove over medium heat. Meanwhile, lightly butter the hamburger buns and broil (or grill) them until just brown. When the burgers are almost done, place one slice of cheese on top of each patty. 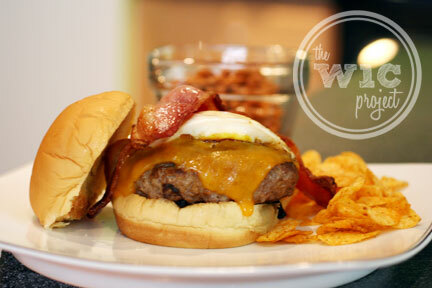 To build your burger, place the patty with cheese on the bun, then top with 1 sunny-side up egg, and 2 strips of bacon. Cooking bacon in a skillet or in the oven. Use some of the bacon grease to oil the bottom of a small frying pan. Cook eggs sunny-side up, sprinkling with seasoning salt before flipping. Set toppings aside until burgers are cooked. One winner will receive a variety pack of Lay’s Regional Flavors potato chips! Disclaimer: This post consists of my (and/or fellow tester) opinions only. Your experiences may be different. This post is part of the Tastes from Home with Frito-Lay recipe contest. I will receive free chips from Frito-Lay for participating in the event. I’d love to try the Chipotle Ranch! I’d love to try Tangy Carolina BBQ flavor the most! I’d like to try out the Balsamic Onion. I like Frito Lay on FB! The Balsamic Sweet Onion sound good. Thanks. I am a facebook fan of Lays. I would love to try the Creamy Garden Ranch flavor. Thanks for the chance to enter! I would love to try the Chipotle Ranch. I love the Cajun Herb & Spice. I’d like to try the chipotle ranch chips. Although I should say I want the Cajun Spice first because I’m a LA girl, I want to try the Carolina BBQ first. Yumm. Like Frito Lay on FB. I’d love to try the Cajun Herb and Spice variety! Balsamic Sweet Onion sounds amazing!!!! I would love to try the Honey Mustard flavor! I want to try the Cajun Herb & Spice. I most want to try Cajun Herb and Spice. I follow Frito Lay on twitter (@RebeccaFH). I follow the WIC Project on twitter (@RebeccaFH). I would like to try chipotle ranch! I’d like to try the Garden Tomato and Basil. I most want to try Honey Mustard! I would like to try Honey Mustard. Would love to try the Creamy Garden Ranch! Cajun Herb & Spice served with plenty of cold beer. I want to try the Balsamic Sweet Onion! I like FritoLay on Facebook, Selinda McCumbers. I follow Fritolay on Twitter, SelindaMcCumber. I follow the WiCproject on twitter, SelindaMcCumber. Link is wrong above, here is the correct one! I would like to try the Creamy Garlic Ranch. I’d like to try the chipolte ranch. I want to try the Balsamic and Sweet Onion. I like Frito-Lay on FB as Sheryl Flickinger. I follow you on GFC as sflickinger. I follow Frtio-Lay on twitter as ssgwkramer. I would love to try the Chipotle Ranch. 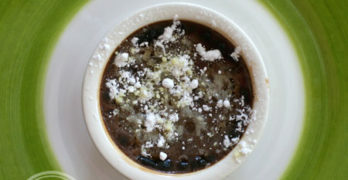 Follow The WiC Project on Google Friend Connect – Gina F.
Ohhh I would love to try the Balsamic Sweet Onion. I’d like to try the Balsamic Sweet Onion. I want to try Carolina BBQ the most. I am a Carolina girl, so this intrigues me! I would pick the Tangy Carolina BBQ. Garden tomato and basil please! I would like to try the Honey Mustard. I like Frito-Lay on Facebook as Nancy H.
I am following Frito Lay on Twitter as njhhb. I would most like to try the cream garden ranch. I’d love to try the Creamy Garden Ranch. I like Frito Lay on FB. I follow Frito Lay on Twitter. I want to try the Chipotle Ranch the most since I love the flavor of Chipotle! I’m a facebook fan of Frito-Lay under username Jennie Tilson. I’d love to try the honey mustard. Creamy garden Vegetable. It is for the Midwest and it does remond me of summer and Farmer’s Markets. I would love to try the Chipolte Ranch! I wNt to try honey mustard! I follow fritolay on twitter as kmayans. want to try the creamy garden ranch sounds good. I’d love to try the chiplote ranch flavor. I want to try the garden tomato & basil flavor the most. I like the WIC Project on twitter as ssgwkramer. I want to try the Chipotle Ranch flavor. I would most like to try the chipotle ranch. I’d like to try the Cajun Herb and Spice flavor. I follow Frito-Lay on Twitter as smdrm. Balsamic Sweet Onion would be my choice of flavors!! I have already tried and LOVE the Garden Tomato & Basil and am looking forward to trying the Chipotle Ranch and Cajun Herb & Spice! I would love to try the Creamy Garden Ranch flavor. I am a fan of Frito Lay via Facebook as Jill Myrick. I am following Frito Lay via Twitter as jlsc123. I’d like to try Honey Mustard! I most eager to try the Cajun Herb & Spice! 🙂 Thank you. I can’t wait to try the Cajun Herb & Spice! I “Like” Frito-Lay on Facebook (Dara Nix)! I already like your FB page (Dara Nix)! I follow Frito-Lay on Twitter (@Kitty32504)! I already follow you via GFC (either under Dara Nix or Cataroo – I can’t see your gadget so I can’t tell…)! I subscribe to your feed with Blogger/Google Reader! Balsamic Sweet onion is my flavor of choice! i follow Frito-Lay on twitter – js22222222 . I’d like to try the tomato garden and basil chips. I want to try the Chipotle Ranch. I would love to try the Balsamic Sweet Onion, looks delicious! I’d love to try Cajun Herb & Spice!